I haven’t posted for quite a while, but I’ve been working on the “Cloaked” series and larger figure paintings. Though I employ friends and family to pose just as models, these paintings most often turn into portraits, like the one above. Can you move to Montana and teach art?? Moving to Montana sounds great, but you’ve probably already cornered the art ed. market! Fantastic, this feels so fresh and breezy somehow. Thanks, James. Yeah, much less energy to keep up with regular posts. Oh such lucky people to have their portraits crafted with your beautiful, artistic hands! A fascinating facial expression . You’ve captured it beautifully Elena ! This piece here…Even though its mostly realistic, reminds me of Max Beckmans figures. The elongation of the hands and the way the figure is bent. very good. In art it is not all about geometric perspective but about emotional and psychological ones. Your portraits always convey expression, mood and aesthetics of the person represented and the artist himself and that is what I love about them. Words I will cherish, from the master. I’m humbled. Thank you, Marcelo. Fabulous work as always Elena! Love the dexterity of the pose with the wondering gaze! Great work, Elena! The way you rendered the background creates an impression of movement, which seems to be your signature. To me, it looks like he’s sitting in a train carriage, oblivious to the world moving behind him. Welcome back, Elena! Fascinating expression he has. Lovely. Great to have you back here, Elena! This is beautifully done, as always. A fine portrait, as ever, capturing an insight into the character of the sitter – although I’m a little less convinced by the arms and hands. Thank you, Louis. I can assure you that this model is unusually flexible, lanky, long fingered and willing to put up with my pushing for extremes in posture. Thank you! Regards to you as well. They are unusual, but real. Thanks so much, Derick. The awkwardness of the pose actually draws the eye to the picture. Wonderful portrait, Elena! I love the expression in his eyes and on his face. There is intensity camouflaged as nonchalance. That’s what I see. I like what you see! Thank you, Tiny. Terrific attitude to this. Love the face and hands. Beautiful! Love the way you handle light. I like the composition too. Good to see you posting again, Elena. 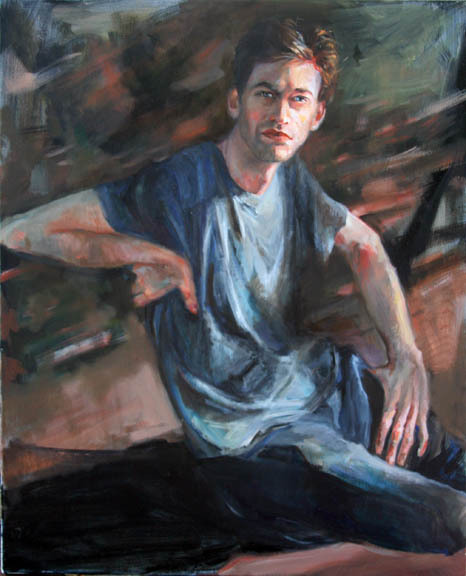 This painting is beautiful; it made me wonder how long your model could hold his arm that way, though. I would have needed a position change in just a few minutes, but then I’m an old gal…. Thank goodness for photographs, otherwise NOBODY would pose for me at all:) Thanks so much, Jill! Wonderful handling of the light and I love the perspective and composition. Thank you, John! I’ve been over at your blog, and read your latest posts. I’m in awe of your abilities, but have nothing nearly as intelligent to say! So, I’ll leave it here with high praise for your intellect, humanity and expression. The look is intense, Elena. The fingers on his left had are long and sinister, as are the fingers of a concert pianist. You’ve guessed it, Prospero. Those long fingers do belong to a musician. It was either that or a sorcerer. But you gave it away while giving your portrait a soul. You silver tongued devil, you. Your comment has made my day. Thank you. Sun was in his eyes:)Thanks, Yoshi. Mâini care nu-și găsesc locul decât în poziții aproape imposibile. Thanks ever so much, Carol.